Honestly, I’m a bit confused. When you say, “home schooling a special child”, does that mean you are the one who will stand as a teacher for your child? Or, will you have to hire somebody to come over your home and do the teaching? I re-read the article, and I apologize if I don’t easily get what does this mean. I have a friend here, a neighbor whose child is a special child. We have another neighbor whose special child has already perished because the parents were not able to give his due attention and the son has passed away. I don’t want it to happen to this another neighbor so I am out to give the parents tips I’m learning from your site. It is the parent usually who teaches the special child in home schooling. They also follow some curriculum, that’s why it’s important to connect with school officials or other people who are knowledgeable about teaching. If somebody goes to the house to teach the child, that would be tutoring. I hope your friend’s child is doing well. Is he in school? What a beautiful post and so important. 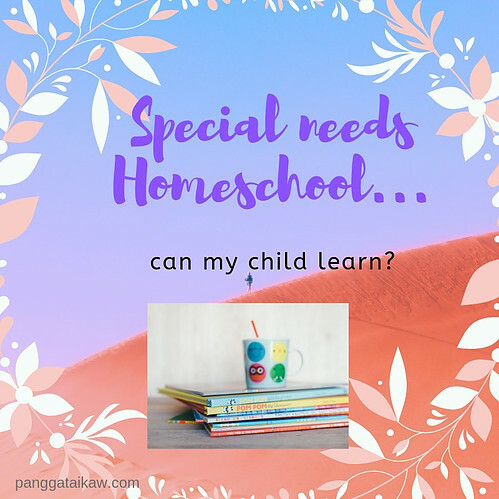 I had never come across before a post that would talk about the importance of homeschooling and especially in the case of children with special needs. Unfortunately I live in Europe and in particular in Spain where home schooling it is still not accepted or I should say not allowed officially by the government, yet I feel that this is the best option for our children. The interest of our children should always come first and who more than a mother will know what her child needs? Thank you. Interesting to know that home schooling is not allowed in your country. Is education free for kids there? Of course, stay at home moms or dads with special kids have always the option to home school if their place allows them. Wow, what an insightful review on this article. Special child require full support from parents and when they get the care required, they will excel beyond expectation. Homeschooling them is the best option one can have because you as a parent know them better, though it might not be easy but is possible. The result will be your pride if you can do this. Nice review on special kids. Good work. The parents know their special kids in and out and home schooling them would be best if they are ready to go beyond the challenges. I think home schooling is very r for a child with special needs to avoid bullying from other kids and also to avoid unnecessary comparison that may cast doubts in the child’s mind. The problem of home schooling is social integration and Sunday school and piano lesson could help the child relate with other children in a more controlled environment. Indeed the home is the safest place for a special child. If the parents decide for home schooling, they should really try to balance optimizing the child’s social and communication skills by letting him join group activities outside the home. This is a very interesting topic. I find myself leaning in the pros of homeschooling. If you have multiple children, surely a flexible time and schedule would be ideal. Also the thought of seeing first-hand your child’s developments and the area that needs to be focused on appeals to me. But it’s also helpful to have an insight to the cons of homeschooling. You really have to weigh the pros and cons before you decide on the schooling of your special child, but just remember that if you have the time and the resources, I personally would prefer home schooling. As for me i think both Special needs home training and the traditional classroom should be complemented with each other. As you have mentioned both the advantages of special needs home training and the disadvantages (which i also agree with you), i think a child that is exposed to both will do better than a child who is just exposed to only the traditional classroom.Thanks so much for this educative post.Hope to get more of these types of posts from you soonest. Of course, when a special child is enrolled in a traditional classroom, the parents need to support him at home and guide and help him with homework so that learning can be maximized. Daily reading is likewise essential at home, even for non-verbal kids to boost their capacity to learn. But if the parent has the time and resources and is confident that he or she can homeschool, why not? They just need to expose the kid to other activities outside the home so that his social skills will not lag behind. I love this idea! You note that a drawback to home-schooling special needs children is lack of social development, but this is true for all home-schooled kids. I think getting together with other home-schooled kids on a regular basis can be the answer and will be advantageous because they will be comfortable with their parent being there. Great, caring article! Out of school activities with other kids and hooking up with other parent-teachers and homeschooled kids are really vital to develop our special kids socially. I have always been pro home schooling. My husband is just not totally convinced. I tr my very best to spend time with my child and assist her in all her school work and activities. This is a great article with lots of valuable information. Maybe I can share with m y husband and somehow, he’ll eventually agree :). Thanks for sharing. Maybe your husband is the traditional type. Just continue to assist your child at home so he can have the best of both worlds. There are so many pros and cons to homeschooling a special needs child. You’d also need to take into consideration how much of a special needs child can adapt with other children and how fast they are able to learn as well. In my opinion maybe try school first so that they have that interaction with others yourself with other teachers and families. I know they have classes strictly for special needs children and my cousin has attended them all his life. It’s taught him how to interact with others as well to the point he has a part-time job bagging groceries. My thinking is to let the child try school first. Of course, the special education classroom is the best for most starters but there are stay at home parents who could do the same or better for their special kids. i would say case to case basis, but it’s not impossible. I recently had the good fortune of reading this article. It was well-written and contained sound, practical advice. In fact, I have really benefited from it. You pointed out several things that I will remember for years to come. I look forward to reading your next informative work. Thank you. Home schooling is good and have a lot of benefits in it. It will help you to understand your child the more and it can also retract your child from indulging in corrupt acts or behaviors in the school learning environment. Despite the fact that home learning is good, I still don’t buy the idea of home school because it can make a child not to socialize properly with people or even suffer inferiority complex. The parents always have the option to choose whichever they want. Homeschooling definitely has its pros and cons and like you said the social skills is the one that will have to really be addressed in this. Like you said, the teacher-parent has the advantage of mentoring her child one-on-one and of course because of this set-up, the child’s progress can be followed really well. With the social aspect, they need to connect with their extended families, friends and other homeschooled kids so the special kids can develop friendship outside the home. Previous Previous post: The indoor play area for kids with special needs – exciting updates! Next Next post: Big sister, little brother…..he has Down syndrome and autism!